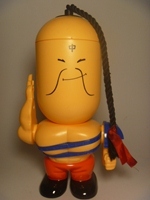 This week is about the Kinnikuman spinoff series called Ramenman! Whenever a TV show creates a spinoff there are varying levels of success. Many times there is absolutely no success. This is the case with Ramenman spinoff. They started off well with some cool packaging (large Ramenman) but it went quickly downhill. Only 14 figures exist in the set across three colors. To be honest, there aren’t too many standout figures, just one in fact – the Futuristic Goalie. The Futuristic Goalie is so special he was considered part of the M.U.S.C.L.E. line. Although, in all honesty, his classification as a M.U.S.C.L.E. was the result of collectors lack of understanding and education rather than how cool the figure looks. But that’s still pretty cool. 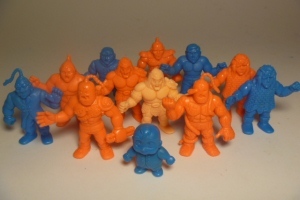 Unfortunately he’s not a M.U.S.C.L.E. figure, but still a figure worth having and so I still search for one. There are some positives to the Ramenman line. 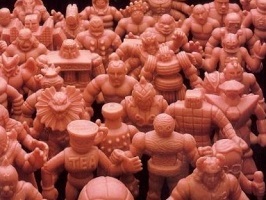 The figures are made in exactly the same vain as the 1991 kinkeshi and Part 29 Kinnikuman re-release and each sculpt is unique to the line. The time to buy it, is when you see it! This entry was posted on Monday, September 2nd, 2013 and is filed under UofM News. You can follow any responses to this entry through RSS 2.0. You can skip to the end and leave a response. Pinging is currently not allowed.